LEDs are not all the same. This is evidenced not only by the performance data and the dimensions but also by the solder pads and the processing options. 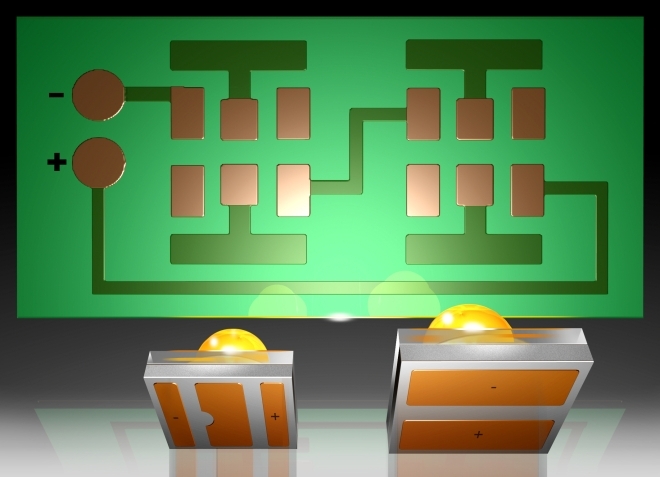 Osram Opto Semiconductors has now developed a concept for uniform solder pads based on the Oslon family, making it easier for customers to use LEDs from different manufacturers (second source) and reducing the costs of storage and processes modification. Second source is the term given to the possibility of using different suppliers for a product in a particular project or for a product series. It should be possible for the products to be incorporated in current production without incurring additional costs. Second source is standard practice for LED components because of the greater security of supply but components from different manufacturers generally differ in terms of their dimensions and the shape of their solder pads. This is why two boards are generally needed for the LEDs from two different manufacturers. This drives up costs for storing the boards and also for modifying the process. For ceramic LED components, to which the entire Oslon family belongs, Osram Opto Semiconductors in Regensburg has therefore developed a concept that makes the board solder pad design so adaptable that it can be used for LED components from at least two different manufacturers. The concept can also be used for metal core, FR4 and ceramic boards. Dr. Christian Gärtner, Oslon Project Manager in Product Development General Lighting at Osram Opto Semiconductors, explains: “Only a small adjustment to the process is needed, and the benefits are real and long-term.” The combined board design comes from the design of one of the two LED components. The individual solder surfaces are divided into segments – into electrically connected and electrically disconnected. By selecting appropriate spacings between the solder surfaces the second LED product – rotated through 90° – can be attached to the uniform board design. The anode and cathode of the two LED components are connected to the same electrically contacted segments. By dividing the solder surfaces the two LED types automatically align themselves to the edges of the solder surfaces during the reflow solder process. For both LED components the luminous area is in the same lateral position on the board – in other words in the same alignment in the board plane. If the LEDs have the same emission behavior the same secondary lenses and reflectors can be used. This means that neither the LED components nor the end application are changed in terms of their characteristics.